(S) Mens Retro Western Shirt! Cream with Fancy Flowers & Decorative Stripes! 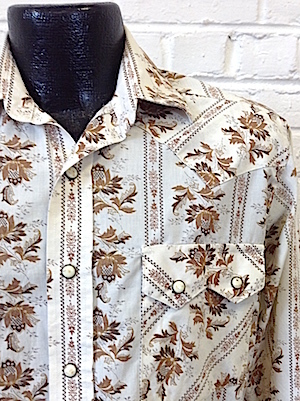 Home > Vintage Western Shirts > XS & SMALL Western Shirts > (S) Mens Retro Western Shirt! Cream with Fancy Flowers & Decorative Stripes! 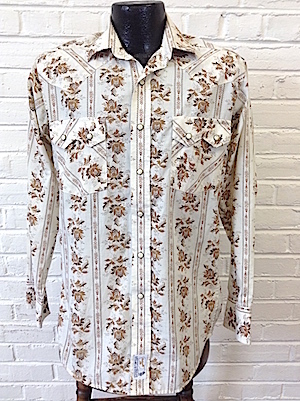 Mens Vintage Western shirt! This decadent western has a cream base with ornate vertical stripes and fancy, swirly flowersi Closes in the front with marbled cream colored snaps with three more on each cuff. Two pockets on the chest with flap and button closures. Shirt has a tapered hem. Tagged by Panhandle Slim. Poly/Cotton blend.